Why is this useful? These .svg files are useful for cutting out two-dimensional shapes for jewelry, stencils, and other design elements; cutting multi-level shapes for 2.5D projects like chocolate molds; and are a great starting point for learning how to cut basic shapes on the Othermill. Many common graphic design and CAD apps can edit and save .svg files. Some of our favorites are Inkscape, Adobe Illustrator, and Sketch. We’ve put together a full .svg file guide for you and now we have an accompanying video, where we show you how to set up Otherplan to mill .svg files on the Othermill. 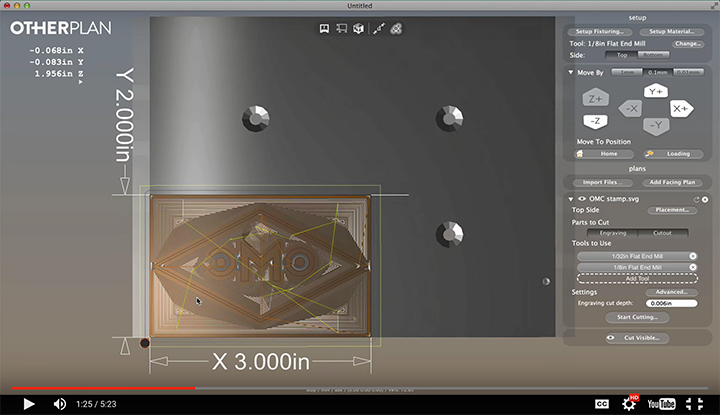 The video uses a linoleum stamp project as the example and provides details on how to optimize your tool use for precision and efficiency. Check out our Snowflake Stamps tutorial for a similar full, start-to-finish linoleum stamp how-to. Our Cloisonné Enamelled Metal Trinkets tutorial provides an example of how .svg files can be used to make custom jewelry. And of course, if you want to eat your .svg files, there’s the aforementioned chocolate molds tutorial. Happy milling! As always, if you have any questions or just want to share what you’ve made, don’t hesitate to reach us at support@othermacine.co. We’re always happy to hear from you!